Check out the latest edition of the ANCAPStar. 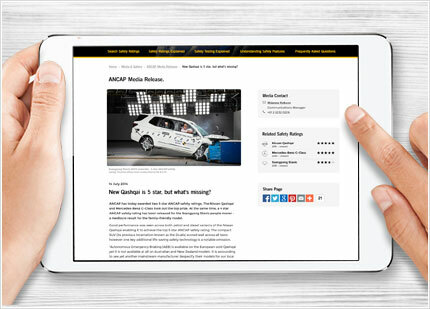 This edition contains the latest ANCAP safety ratings and news from the Australasian New Car Assessment Program (ANCAP). ANCAP is Australasia's leading independent vehicle safety advocate. ANCAP provides Australian and New Zealand consumers with independent vehicle safety information through the publication of ANCAP safety ratings. ANCAP safety ratings take into account the level of occupant and pedestrian protection provided by new cars through the conduct of physical crash tests and the assessment of collision avoidance technologies. Our member organisations include all Australian automobile clubs, the New Zealand Automobile Association, Australian Federal, State & Territory Governments, the New Zealand Government, the Victorian Transport Accident Commission, NRMA Insurance and the FIA Foundation (UK). Meet all of our member organisations. Australian 5 star trends and benefits. During 2015 it is estimated that around 40% of annual kilometres travelled will be in 5 star cars. By 2020, it is predicted that this will increase to nearly 70%. As a result, ANCAP estimates that there will be 1/3 less Australians killed or seriously injured in cars by 2020. The societal cost savings are estimated to be more than AU$2 billion per year. Due to the uptake of 5 star cars across the Australian fleet, ANCAP predicts a one-third reduction in the number of Australians killed or seriously injured by 2020, compared with 2001, when there were no 5 star rated cars on our roads. "As a result of safer cars, the risk of being killed or seriously injured on Australia's roads today is halved compared to 15 years ago," said ANCAP Chief Executive Officer, Mr Nicholas Clarke. "ANCAP has been instrumental in increasing car safety and this will only increase as ANCAP continues to raise the bar through increasing requirements." The study conducted by ANCAP evaluated the uptake of key safety features such as curtain airbags, electronic stability control and intelligent seat belt reminders between 2001 and 2014. The uptake of these features strongly influenced by the ANCAP rating system. "Every dollar invested in ANCAP translates to a saving of several hundreds of dollars in societal crash costs." "We can expect to see similar savings across other world regions in which non-regulatory NCAP programs exist," said Mr Clarke. Full details can be found in the paper, Vehicle safety trends and the influence of NCAP safety ratings, presented at the 24th International Technical Conference on the Enhanced Safety of Vehicles (ESV) in Sweden last week. To encourage the early introduction of new vehicle safety features and advanced safety technologies - promoting continuous improvement in vehicle safety - ANCAP has been progressively raising the bar since its formation in 1992. For example, in 2001 ANCAP introduced minimum performance requirements for its frontal offset and side impact tests to achieve a 5 star rating. In 2004, minimum head protection scores in the pole test were also added. In 2008, electronic stability control (ESC) became a mandatory 5 star requirement - well ahead of regulation. From 2011, the safety requirements across all star rating levels have increased annually and ANCAP continues to broaden its suite of physical crash tests and introduce performance testing of key life-saving safety assist technologies (SAT). 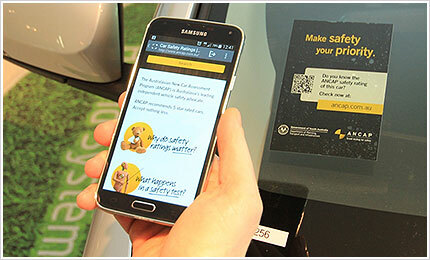 ANCAP is committed to continuing to raise the bar on vehicle safety. Australasia's leading independent vehicle safety organisation, ANCAP, has today published the maximum 5 star ANCAP safety rating for the new Kia Sorento. Global NCAP Media Release: The Global New Car Assessment Programme (Global NCAP), the overarching vehicle safety advocacy body, today expressed its disappointment in recent media coverage across Australia which criticises the vital work undertaken by the national consumer information organisation, the Australasian New Car Assessment Program (ANCAP). ANCAP has awarded the new generation Mitsubishi Triton a 5 star ANCAP safety rating. 5 star ratings have also been awarded to the BMW i3, Land Rover Discovery Sport, Renault Captur and Tesla Model S. The BMW 2 Series Active Tourer and Mini Cooper have scored 4 stars. A 4 star ANCAP safety rating has today been released for the new Kia Carnival people mover. This disappointing 4 star rating is a result of less than optimal performance in the frontal offset crash test and the omission of a required safety assist technology. Make safety your priority. This is the latest call-to-action being promoted by ANCAP in conjunction with participating Stars on Cars™ dealerships across South Australia. With the assistance of ANCAP and the SA Department of Planning, Transport and Infrastructure, a mix of metropolitan and regional SA new car dealerships have been encouraging the purchase of 5 star models for a number of years through the application of safety rating labels and other point-of-sale materials throughout their dealerships. The SA campaign was reinvigorated last month with local Minster for Road Safety, Tony Piccolo MP, urging consumers to make safety the top priority when buying a new car. "In today's market, top safety rated vehicles are available in all categories and can accommodate most budgets," Mr Piccolo said. "There are a range of tools available that can help us choose the safest car to drive including the ANCAP safety ratings. I encourage everyone to use these tools to make your next car purchase the safest one." ANCAP continues to work with member organisations across all States and Territories to promote the importance of buying a safer car through a variety of campaigns and initiatives. More information about ANCAP's Stars on Cars™ programs can be found at ancap.com.au/stars-on-cars. Study confirms effectiveness of Autonomous Emergency Braking. Low-speed autonomous emergency braking (AEB) has been shown to reduce real-world rear-end crashes by 38%. This was one of the key findings from the research project jointly commissioned by ANCAP, the Department of Infrastructure & Regional Development and ANCAP's sister organisation, Euro NCAP. The study revealed there was no significant difference between urban and rural crash benefits; and concluded that low-speed AEB needed widespread fitment for maximum benefits. AEB is one of the more promising safety assist technologies that is becoming available on new cars - more commonly overseas than in Australia and New Zealand. The low-speed version - referred to by ANCAP as "AEB (City)" - usually consists of an automatic brake function that operates for speeds up to 30km/h or 50km/h. "Previous studies have predicted significant benefits from AEB technology in low-speed rear-end crashes and current research is now demonstrating its effectiveness," said ANCAP Chief Executive Officer, Mr Nicholas Clarke. "ANCAP and the Department, together with Euro NCAP, established an expert group of representatives across governments, industry, consumer and insurance organisations to determine the effectiveness of AEB in reducing real-world crashes." Data from five European countries and Australia was used with the findings showing a 38% overall reduction in real-world, rear-end crashes for vehicles fitted with low-speed AEB compared to a sample of equivalent vehicles without AEB technology. "These findings strongly support ANCAP's push to have manufacturers fit AEB as standard across all new cars," said Mr Clarke. AEB performance testing is being introduced as part of the ANCAP safety rating process. To view AEB in action, take a look at the 'Images & Video' page for the 5 star Land Rover Discovery Sport. The research group, which includes the expertise of Professor Claes Tingvall (Swedish Transport Administration), Professor Brian Fildes (Monash University Accident Research Centre) and Dr Michael Keall (University of Otago), will next examine the effectiveness of lane keep support systems (LSS, or lane keep assist). ANCAP expects similar benefits from LSS in the prevention of a range of crash types including run-off road, same direction, and opposite direction crashes. International vehicle safety experts gather in Gothenburg. 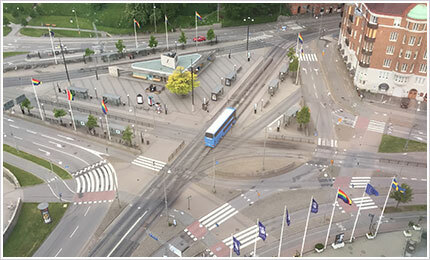 The 24th International Technical Conference on the Enhanced Safety of Vehicles (ESV) was held in Gothenburg, Sweden from 8-11 June 2015. ESV is an international forum organised by the US Department of Transportation's National Highway Traffic Safety Administration (NHTSA) which provides the opportunity to share innovative advances in motor vehicle safety and encourage international cooperation. It is attended by governments, automobile manufacturers / suppliers, safety researchers and professionals, medical, insurance, legal and policy professionals, consumers and academia from across the globe. This year's conference focussed on the future of vehicle automation and its potential impacts and safety benefits. The conference highlighted the rapid pace at which advanced safety technologies are being developed and the efforts made by governments, manufacturers, consumer groups and others around the world to facilitate and encourage such technologies. In conjunction with ESV, senior policy, technical and communications representatives from New Car Assessment Programs (NCAPs) around the world joined with Global NCAP and NHTSA Administrator, Mark Rosekind, to provide updates on their regions' current vehicle safety activities and future plans. Discussion surrounded increases to rating requirements across each NCAP region and the ongoing introduction of new tests and assessments to further improve vehicle safety. Of particular focus was autonomous emergency braking (AEB) and NCAPs' promotion of this life-saving technology across all markets. The Japanese-based program, JNCAP, noted a significant increase in the availability of AEB on new cars in its market and encouraged the adoption of AEB systems with pedestrian detection capability - given the high rate of pedestrian fatalities on Japanese roads. The diversity in transport, traffic conditions and vehicle types across the world was highlighted in both ESV and Global NCAP discussions. This diversity again underscored the importance of NCAPs in all world regions - as endorsed by the UN General Assembly last year - particularly given the variation in vehicle safety specification across markets. Worldwide, approximately 270,000 pedestrians are killed on roads each year, equating to 22% of all road traffic deaths (WHO, 2013). In general, pedestrian road deaths are decreasing however pedestrians still make up a significant percentage of Australian road fatalities. Between 2010 and 2014, 13% of Australians killed on our roads were pedestrians. Pedestrians aged 75 and older are overrepresented. Male pedestrians are more than twice as likely as female pedestrians to be fatally injured in a road crash for all age groups, except those aged 65 and older. While major cities have the highest number of fatal pedestrian crashes, the rate per 100,000 people is the lowest. Conversely, very remote regions have the lowest number of fatal pedestrian crashes but the highest fatality rate per 100,000. Over 60% of fatal pedestrian crashes occur where the posted speed limit is 50km/h or 60km/h. Crashes involving a pedestrian fatality peak between 6-9pm on weekdays and between 12-3am on weekends. Pedestrian protection is a key component of a vehicle's overall ANCAP safety rating. ANCAP's pedestrian impact testing simulates accidents in which a pedestrian is hit by an oncoming vehicle, and is used to estimate head and leg injuries to child and adult pedestrians. ANCAP pedestrian tests are conducted at a speed of 40km/h. To check the level of pedestrian protection provided by your car, search by make and model at ancap.com.au/safety-ratings. Information on the range of tests ANCAP conducts can be viewed on the Crash Testing Explained page of the ANCAP website. Higher ANCAP safety ratings help New Zealanders lower their registration costs. New Zealand's Accident Compensation Corporation (ACC) together with ANCAP member organisation, the NZ Transport Agency (NZTA), will from 1 July 2015 introduce a new calculation method for light passenger vehicle levies. This new method will be based on how well a vehicle can protect occupants and other road users from serious injury in a crash. Vehicles manufactured from December 2011 onwards will be "risk rated" by the ACC using ANCAP safety ratings. The ACC's vehicle risk ratings are not based on the age or value of a vehicle, rather, how their design and manufacture influences the injury outcomes when that vehicle is involved in a crash. From July, the cost of the ACC levy portion of NZ vehicle licensing fees (registration) will decrease by an average of 41% depending on the make/model of vehicle. Most light passenger vehicles will be assigned a levy band of between 1 (a vehicle with the most injury risk) and 4 (a vehicle with the least injury risk). Go to rightcar.govt.nz and enter your vehicle number plate. Further detail on the ACC's policy can be found here. Japan NCAP awards 10 top safety ratings. To achieve a 5 star JNCAP rating, a vehicle must perform highly across each of its physical crash tests (full width frontal, frontal offset, side impact, rear collision (whiplash) and pedestrian protection) and as a result, achieve an overall point score of 170 or above out of a possible 208 points. Given the high proportion of pedestrian fatalities in Japan (approx. 40%), equal weighting is given to both occupant protection and pedestrian protection under the JNCAP rating scheme (100 points and 100 points respectively. 8 points are allocated for the presence of intelligent seat belt reminders). JNCAP also assesses vehicle braking systems, seat belt reminders, seat belt usability, lane departure warning and autonomous emergency braking. Like ANCAP, overseas test programs perform a range of tests and assessments on new passenger vehicles however the test protocols and calculation methods used differ, catering for respective jurisdictional and environmental differences. Because of these differences, as well as differences in the specification of models sold in Australia and New Zealand compared with those sold in other markets, safety ratings from overseas test programs should be used as a guide only. JNCAP is one of nine NCAPs, or test programs, established around the world to promote safer vehicle choices for consumers. In addition to ANCAP, other test programs are located in, and cover the markets of, Europe, the United States, Korea, China, Latin America and South East Asia. New technology from Ford can automatically prevent drivers exceeding limits. Speed is an obvious contributor to road crashes and their severity. To assist in ensuring speed limits are not exceeded, Ford of Europe is launching a new technology. 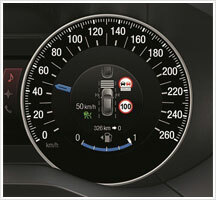 Intelligent Speed Limiter enables automatic adjustment of maximum vehicle speed to remain within legal limits. This technology will debut on the Ford S-MAX - one of Ford's European-supplied people movers. Drivers have for some time been able to set a maximum speed for their vehicle (manual speed limiter). Ford's Intelligent Speed Limiter system can help ensure the maximum speed is automatically adjusted to remain within changing speed limits. The system uses a windscreen-mounted camera to monitor road signs and when the speed limit is lower than the maximum speed set, the system slows the vehicle as required. As the speed limit rises, the system allows the driver to accelerate up to the set speed, providing it does not exceed the new speed limit. "We're not just developing cars at Ford, we're also developing technologies to make driving more convenient, safer, and ultimately help improve mobility around the world," said Pim van der Jagt, executive technical leader, Ford Research & Advanced Engineering. "Innovative systems like Intelligent Speed Limiter, Pre-Collision Assist with Pedestrian Detection, and Active Park Assist are making the benefits of semi-autonomous technology accessible to everyone." Speed assistance systems, such as intelligent speed limiters, are one of the safety assist technologies (SAT) recognised by ANCAP, and already form part of the ANCAP safety ratings that are based on European testing. More and more safer cars on our roads. The proportion of new 5 star rated cars entering the Australian fleet continues to hold strong in 2015 with 80% of all new passenger, SUV and light commercial vehicles sold across the first four months of the year (some 280,000 cars) holding the maximum ANCAP safety rating. A 5 star majority is also the case for the New Zealand new car fleet, occupying a 77% slice of all new cars sold. While significant decreases in the number of new cars sold in Australia and New Zealand were seen across the months of March and April compared with January and February (-10% and -6% respectively), the distribution of those sales across each of the star rating categories remained relatively consistent. ANCAP safety ratings are now available for 92% of the Australian, and 91% of the New Zealand new vehicle fleets^. To check the ANCAP safety rating of your current or prospective new car, visit ancap.com.au/safety-ratings. Secondary, or multi-collision braking is a safety assist technology (SAT) that applies a car's brakes to prevent or mitigate a subsequent impact following an initial collision. Following a primary crash, if the braking system is sufficiently intact to brake safely and effectively, certain triggers - such as the cars airbags having been fired - tell the car to apply the brakes to prevent it from moving. This reduces the chances or severity of a secondary impact - for example with another car or nearby object. Simultaneously, the car's brake lights are illuminated and hazard warning lights engaged. A significant number of vehicle crashes involve multiple collisions. Safety assist technologies such as this are therefore very important as many of the active and passive vehicle protection systems, such as airbags and seat belt pre-tensioners, have already been deployed in the primary crash and are therefore unable to provide further benefit should the vehicle be involved in a subsequent collision. It is estimated that if all cars were equipped with secondary/multi-collision braking, around 8% of fatalities and 4% of serious injuries could be addressed each year*. Information on a range of safety assist technologies can be found in the Understanding Safety Features section of the ANCAP website. What proportion of total serious injury and fatal crashes does ANCAP testing represent? A Monash University report has shown that frontal crashes make up approximately 60% of total serious and fatal injury crashes. After frontal crashes, side impact crashes make up the next highest number of serious injury and fatal crashes (approx. 30%). Pole test conducted at 29km/h (approx. 15% of serious crashes are intrusive side impacts). Pedestrian protection test conducted at 40km/h (approx. 16% of fatal crashes are pedestrian strikes; ~35% involve vulnerable road users). Whiplash protection test conducted at 16km/h (approx. 20% of all crashes are rear-end crashes). At an international level, New Car Assessment Programs (NCAPs) are under constant review to ensure that they best meet the needs of consumers. Other types of crash tests and safety feature assessments are being introduced by ANCAP and other NCAPs year on year. To view more information on the tests ANCAP conducts, visit the Crash Testing Explained section on the ANCAP website. Detail on ANCAP's increasing requirements can be viewed here. * Please visit ancap.com.au to check variant/model year applicability. Is your car 5 star? Click here to view the crash test results for over 530 vehicles. Our organisation has a 5 star vehicle purchasing policy but we are unsure if we also need to stipulate that electronic stability control (ESC) as an additional requirement. Do cars which have been rated with a 5 star ANCAP safety rating already feature ESC? ANCAP introduced ESC as a mandatory requirement for 5 star rated cars in 2008. Vehicles awarded a 5 star ANCAP safety rating from that year feature ESC (unless specifically stated otherwise). The best way to check if a specific model/variant is equipped with ESC is to look at the Technical Report that is published for each model rated by ANCAP. The Technical Reports make specific mention of the availability of ESC and other key vehicle safety features. Technical Reports can be viewed by clicking on the "Full Technical Report" link contained within the grey "More Information" box alongside each individual rating. You may also find the "ANCAP Safety Rating Requirements" table located on our Future Requirements page useful. This table outlines the minimum requirements needed for each star rating (1-5 stars) across the years 2011 to 2017. You will see that ESC is listed as one of the mandatory safety features for 5 stars from 2011 (as mentioned above, this mandatory requirement commenced from 2008). ESC has been a mandatory requirement for 4 stars since 2012; for 3 stars from 2013; for 2 stars from 2014; and from next year, it will not be possible to achieve even a 1 star ANCAP safety rating if a vehicle lacks ESC. I am looking for clarification on the safety assist technology called Emergency Brake Assist (EBA). Are you able to clarify whether this is helpful if I brake on corners or only when I'm on a straight road? Or is it just helpful in any situation where I slam on my brakes? Emergency Brake Assist is a system that offers maximum braking in emergency situations where the driver has not quite applied maximum braking themselves. Generally, the system detects that the brakes have been applied in an emergency situation by measuring the speed and force of brake pedal application. In these cases, the system applies additional brake pressure making use of complementary braking systems such as antilock braking systems (ABS) and electronic stability control (ESC) to ensure maximum braking is applied. As the system complements other braking technologies which assist in maintaining control of the vehicle, it can activate in emergency braking situations on corners as well as straights. Ask one of our experts via our website. © 2015 ANCAP Unsubscribe from future ANCAP emails.